The objective of the study was to assess O 6-methylguanine-DNA methyltransferase (MGMT) immunoreactivity in pituitary adenomas of silent subtype 3 as a potential indicator of temozolomide susceptibility. The Mayo Clinic Anatomic Pathology Database was searched for all cases of silent subtype 3 pituitary adenoma. 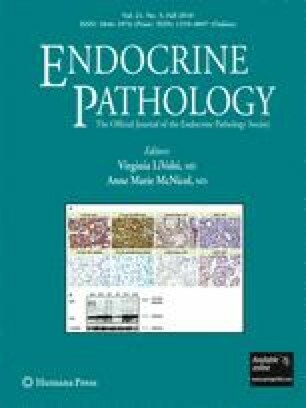 Each of the 23 cases identified had been confirmed on the basis of histology, immunohistochemical staining for pituitary hormones, as well as on diagnostic ultrastructural criteria. Unstained microscopic sections were immunostained for MGMT and were semiquantitatively assessed. Of the 23 tumors examined, 18 (78%) showed no MGMT immunoreactivity. The remaining five (22%) showed immunoreactivity in ≤50% of tumor cells. Among eight of the most clinically aggressive tumors in this study, six (75%) lacked MGMT immunoreactivity. The observed lack of or low-level expression of MGMT by this distinctive, clinically aggressive form of pituitary adenoma suggests potential efficacy of treatment with the alkylating agent temozolomide.